If several variables that are functions of time t are related by an equation, we can obtain a relation involving their (time) rates of change by differentiating with respect to t.
If one leg AB of a right triangle increases at the rate of 2 inches per second, while the other leg AC decreases at 3 inches per second, find how fast the hypotenuse is changing when AB = 6 feet and AC = 8 feet. 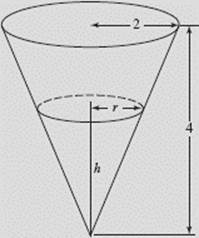 The diameter and height of a paper cup in the shape of a cone are both 4 inches, and water is leaking out at the rate of cubic inch per second. Find the rate at which the water level is dropping when the diameter of the surface is 2 inches. SOLUTION: See Figure N4–22. We know that and that h = 2r. When the diameter is 2 in., so is the height, and The water level is thus dropping at the rate of in./sec. Suppose liquid is flowing into a vessel at a constant rate. The vessel has the shape of a hemisphere capped by a cylinder, as shown in Figure N4–23. Graph y = h(t), the height (= depth) of the liquid at time t, labeling and explaining any salient characteristics of the graph. SOLUTION: Liquid flowing in at a constant rate means the change in volume is constant per unit of time. Obviously, the depth of the liquid increases as t does, so h ′(t) is positive throughout. To maintain the constant increase in volume per unit of time, when the radius grows, h ′(t) must decrease. Thus, the rate of increase of h decreases as h increases from 0 to a (where the cross-sectional area of the vessel is largest). Therefore, since h ′(t) decreases, h ″(t) < 0 from 0 to a and the curve is concave down. 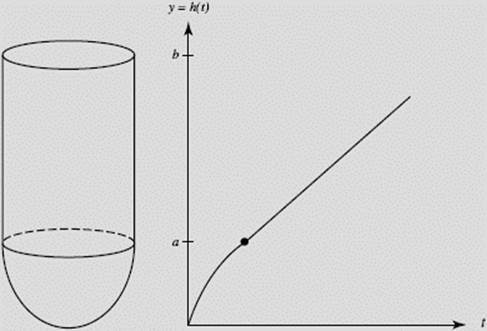 As h increases from a to b, the radius of the vessel (here cylindrical) remains constant, as do the cross-sectional areas. Therefore h ′(t) is also constant, implying that h(t) is linear from a to b. Note that the inflection point at depth a does not exist, since h ″(t) < 0 for all values less than a but is equal to 0 for all depths greater than or equal to a.